We hope these reports of previous Honeyguide wildlife holidays give a good feel of the style of our holidays and the wildlife to be enjoyed on them. Included here are reports from some destinations not in the current Honeyguide programme. These may return to the programme in a future year, or could be arranged for RSPB local groups, natural history societies or other groups. Please contact the Honeyguide office for more information. The reports are in PDF format which needs Adobe software to enable you read, download or print reports. You can download this from here. Cévennes June, and additional photos here. 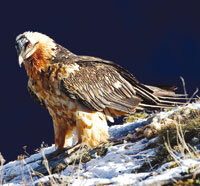 The best place to see these magnificent birds of prey is the Spanish Pyrenees or the French Pyrenees. One Honeyguider's lone visit after the group didn't arrive. A private tour for two Honeyguiders with Geoff Crane. South Africa's Western Cape October/November, a private tour for two Honeyguiders with Geoff Crane. 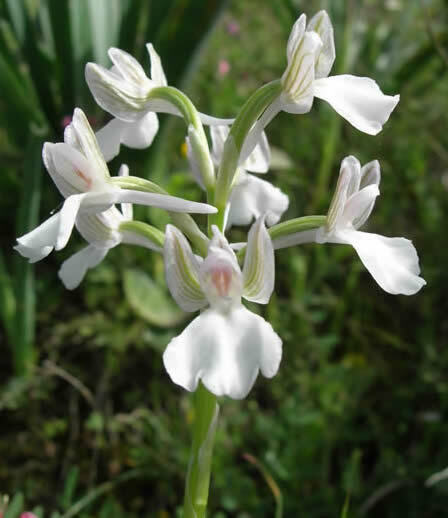 Two colour variants of Orchis boryi on Crete. Photos by Ivan Nethercoat and Chris Durdin. 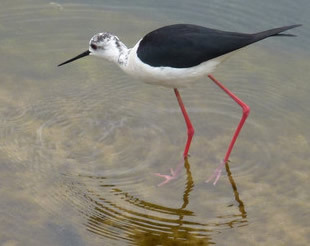 There is an archive of Stephanie Coghlan's Crete Bird Reports since 1986 here. Volcanic ash: in 2010 there is no Crete holiday report, for the first time for many years, as this holiday was called off when flights were cancelled due to volcanic ash. For the same reason, the Menorca holiday was postponed from April to to May. 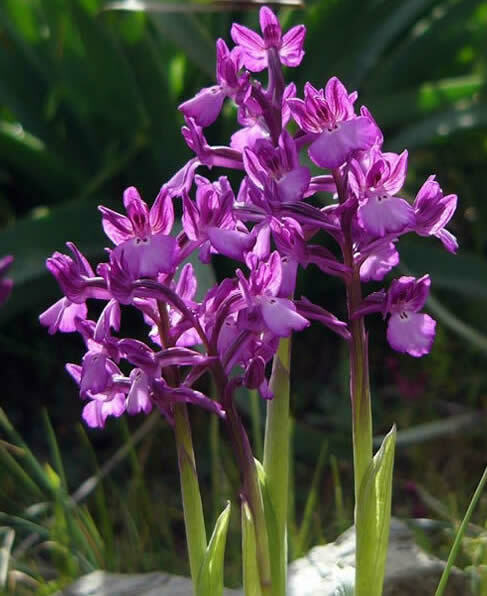 The Central Portugal holiday report for April 2010 includes an account of the group's return overland, via the Dordogne. There was no French Pyrenees holiday or report, for a holiday scheduled to run in September 2010, as it was cancelled due to air traffic control strikes in France. There is no Danube Delta report for 2007 as the holiday was block-booked for a group, which then didn't happen. Italy/Slovenia in 2007 isn't a full report, the only gap in the archive, with wildlife lists and highlights circulated only. 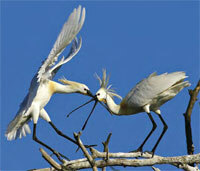 ‘Fight for the right’, spoonbills by Daniel Petrescu in the Danube Delta. 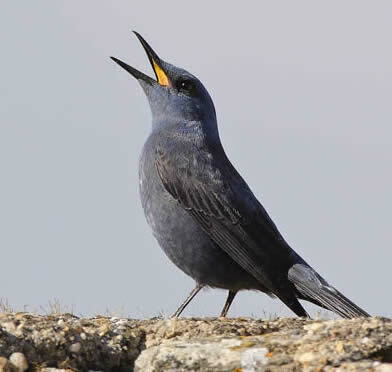 Blue rock thrush (Steve Fletcher). A bird that can be seen on many Honeyguide holidays in Europe, including Extremadura and Istria. 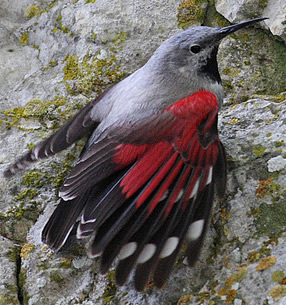 Wallcreeper (Svetoslav Spasov) Bulgaria is the place to go to see these. Or read more on our wallcreeper page. What is a PDF? It stands for Portable Document Format, a document that can be sent, viewed or stored independent of varying computer software and operating systems. So PDFs don't get mangled over the internet like the formats of Word documents and emails sometimes do. Often you see the logo on the right to indicate a PDF you can click on, but it's not necessary and they would certainly clutter the list of reports to the left. Dordogne holiday reports 2001-2008 exclude the complete flower list included in the printed version. That was on an excel file and not included on the web version, though is included from 2009. Those lists are available from the Honeyguide office. Some holiday reports refer to thank-you letters from conservation bodies that were in Honeyguiders' printed reports but not always in these electronic versions. This page has 194 holiday reports covering 195 group holidays (one report, Cévennes 2009, is for two holidays that ran back-to-back). Add in the reports on the page for 1991-2003 and there are 286 reports for about 295 holidays. The first year when all reports are all colour is 2009, plus a few before then.